Heat oven to 400°F. Turn four 6-ounce custard cups upside down onto cookie sheet. Spray both sides of each tortilla lightly with cooking spray. Place tortilla over each cup, gently pressing edges toward cup. Bake 8 to 10 minutes or until light golden brown. Remove tortillas from cups; place upright on serving plates. Spray 8- or 10-inch nonstick skillet with cooking spray; heat over medium heat. Cook potatoes and bell pepper in skillet about 5 minutes, stirring occasionally, until potatoes are light brown. Mix eggs, milk and salt; stir into potatoes. Cook about 3 minutes, stirring occasionally, until eggs are almost set. 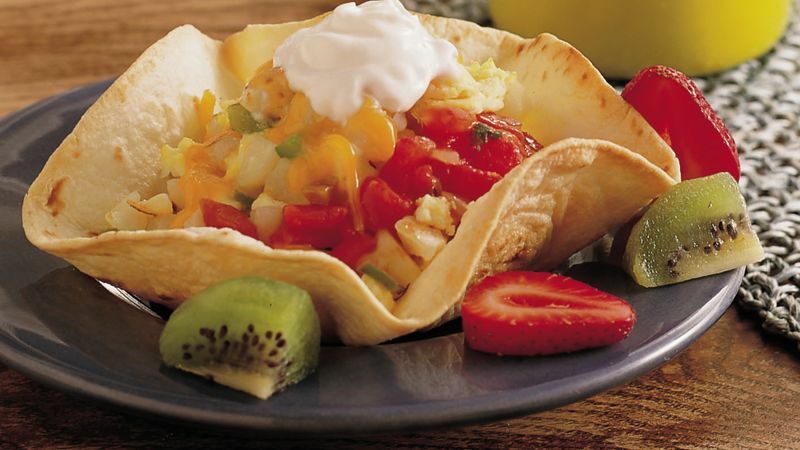 Spoon one-fourth of the egg mixture into each tortilla cup. Top with cheese and sour cream. Serve immediately with salsa. This recipe is not only high in calcium, it’s a good source of fiber as well.